This bear has a girl's outfit, but can be dressed in boy's clothes as well, which includes jeans and a shirt. 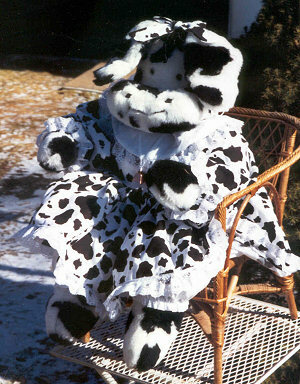 The cow's head and arms are jointed and the fur cannot be customized. Cows are designed to sit, a stand is not necessary nor is one available. The fur pictured is: Cow (Black & White). See all available fur styles. The size pictured is: Cow, 22 inch.